I recently had the opportunity to complete a project that I started 7 years ago, when my mother passed away. My mother died in 2009 after a long battle with kidney cancer. She was treated for the last few years of her life at the City of Hope in Southern California, a wonderful center for cancer treatment. Although my mother taught elementary school for over 30 years, her passion in life was art. She loved many forms of art including painting, drawing, sculpture, and ceramics and she studied all of them but was chiefly a painter of abstract art. Her art career spanned over 40 years, which included earning a master's degree and some time teaching art. 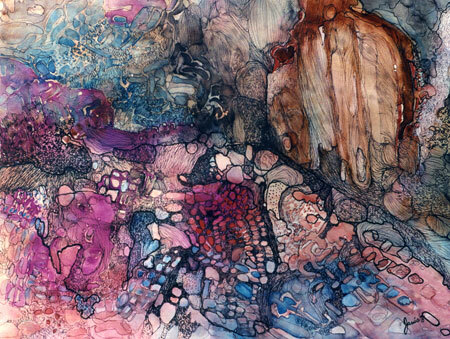 She showed her work in galleries and art shows, mainly in Southern California, where she developed a good following of people who really admired her talent with colors and shapes. I have several of her paintings at my office and get many compliments on them. She was still doing art up until 6 months before she passed away. Although my mother did sell her art, she was prolific and after she was gone we still had over 130 of her paintings, some sculptures, and hundreds of drawings and prints. My sisters and I had many pieces of her art so the question was: What should we do with the remaining art? 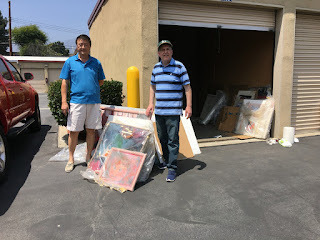 The City of Hope had been very wonderful to my mother and I decided to see if I could sell some of her art and donate all of the proceeds to them. The goal was to get her art out there for people to enjoy and at the same time raise some money for kidney cancer research. This was an ambitious project for me, a non-artist. I really did not know much about the art world, other than what I had learned from my mother. I had helped her at some art shows and got to learn a little about it that way. 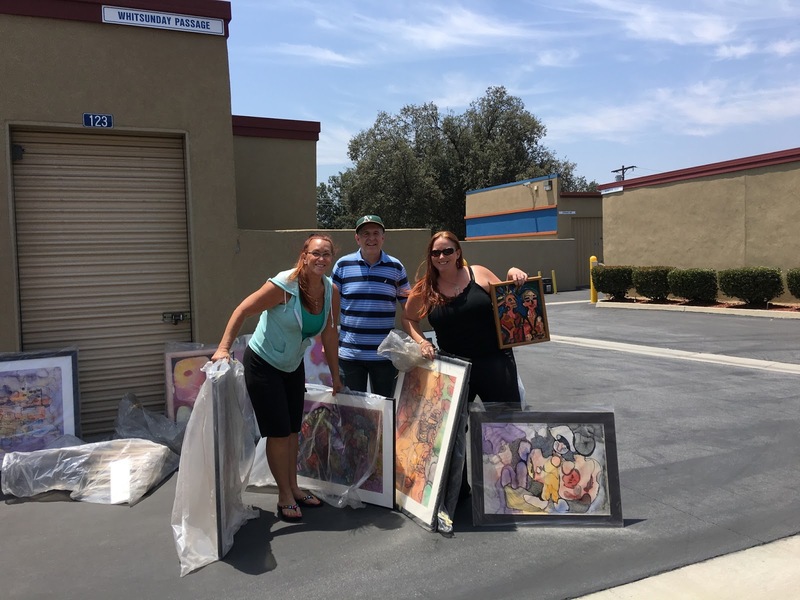 The first thing I did was to get all of her art into storage in Southern California. I rented a U-Haul and my nephew helped me move all of the art. My mother had a website for her art but it didn’t have many of her paintings on it so I hired an art student to help me photograph the remaining art and I uploaded the photos of the remaining paintings. 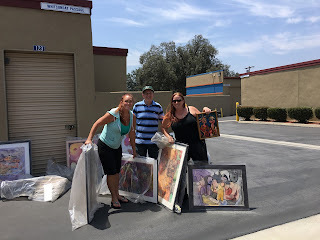 I contacted the City of Hope and they took some pieces for a fund-raising auction and I gave a painting to my mother’s oncologist and one to the nurse who cared for her. I wrote to auction houses, galleries and art dealers throughout Southern California. Some of the art dealers and gallery owners did like her work but they could not commit to anything. They explained to me that the art world was getting increasingly competitive and that they were constantly being inundated with requests from artists trying to sell and market their work. I realized this was going to be difficult. I constantly asked for advice and what I was told was that the best avenue for selling my mother’s art was to contact the people who had previously bought from her. My mother had a mailing list of over 200 people who had bought her work or talked with her at one of her shows. I composed a letter to all of them, telling them of my mother’s death and explaining the project I was working on. 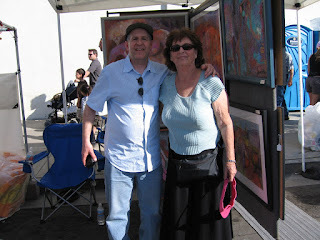 I provided the link to her website and offered to deliver the paintings personally to anywhere in Southern California. I received many very nice letters and e-mails back. People told me stories about meeting my mother at art shows and it was very heartwarming. A number of people wanted to buy her work and I initially sold about 30 paintings this way, delivering them to the Los Angeles and San Diego areas. It was a fun experience for me to walk into people’s homes and see my mother’s art on their walls. I got to see how much people admired her and her art. I continued this project for some years, always working on it when I made trips to Southern California. I continued to contact people from her mailing list who asked me to stay in touch and I was able to sell some more paintings this way. I wrote to hospitals, banks, cafes, hotels (anywhere I would see art) and asked them if they would display my mother’s art. Some expressed interest but told me that they were inundated with requests and had a waiting list of artist’s work to display. A few years ago I decided to donate her remaining art. I had exhausted my best avenues for selling it and I had raised thousands of dollars for research at the City of Hope. I wrote to art departments at colleges and universities and asked for advice. Most had no ideas but one suggested I try health care facilities and senior centers so I wrote to some in the Pasadena area, where the art was being stored. I was able to donate some paintings that way. I would sometimes list the paintings for sale on craigslist before one of my trips and I sold a few that way. Recently I realized that I still had around 60 paintings left as well as many drawings and prints. I wanted to complete this project. Listing the paintings for sale on craigslist had never brought about a big response. This time I decided to do something different. I posted an ad on the "free" section of craigslist. I was a little wary of doing this as I wanted my mother's art to go to people that would appreciate it. The "free" section is filled with things like old couches and computer monitors that people want to get rid of. Would I find people there that would appreciate original abstract art of the type my mother did? I placed the ad, showing just one painting and saying that I had some beautiful, original art to donate to those who would appreciate it. The response to just this one painting stunned me. Within just 2 days, over 50 people responded to my ad, many asking if they could come right away to see the art. I wrote back to everyone and sent them a link to the website, where they could see everything. This generated even more interest and I received many more e-mails about how much people admired my mother's art. 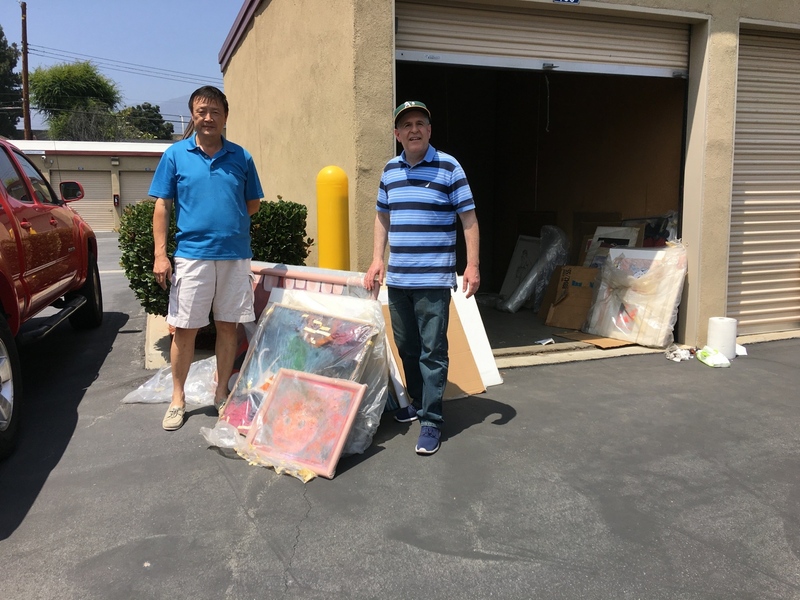 I had a trip planned to Southern California where I could only be at the storage unit for one day and I set up some time for people to look at my mother's paintings. When I arrived in Pasadena, I first set aside time for a few people that had previously purchased my mother’s art. One woman came all the way from Phoenix and another from San Diego to choose some of my mother’s art. I also gave some pieces to the director of a health care facility near Pasadena. After that, I met with people who had contacted me regarding the ad I placed. There were 15-20 people that came. One was a woman who wanted some paintings for a fundraiser for her father, who had just been diagnosed with cancer. Others came who had just moved into new homes and were looking for some original art. One man was an art instructor who wanted to use some of my mother’s art for his classes. What they all had in common was that they loved and appreciated my mother’s work. The people who came were of all ages and what I learned is that there is a real hunger for original art, even though many people cannot afford it. By the end of the day, all of the art was gone and some were disappointed that there was not more. I had found a place for all of my mother’s art and my project was completed. I asked people to send me photos of my mother’s art when they had it up and many have done so. Everyone who came on that day was very grateful for this donation of art. What they didn’t understand was that I was very grateful as well. Before my mother passed away, not wanting to burden me, she had told me to toss out her art after she was gone. I told her that I would not do that. Over 7 years I was able to sell and donate her remaining work to people who really appreciate it and I am very happy that I was able to end the project this way. Wow! What a GREAT Heart Warming Story. Dr. Janis. Thanks for sharing. She is a truly talented artist! Thank you so much for taking the time to share this very personal story of love and commitment. What a tribute to your mother! How wonderful that her art is out there being enjoyed by so many. You went the extra mile to ensure that her legacy would be honored. Although it was a long and time consuming project for you, the blessings you have passed on to so many will come back on you. Sounds like they already have. I truly enjoyed reading this article and was extremely moved by such dedication and perseverance. Thanks, Shawn and Sue. I appreciate the very nice comments. It was a meaningful project for me to work on. I am glad that it is done but a little sad as well. I definitely am happy that I was able to complete it this way, with so many people coming to see my mother’s art.